The Stock Connector add-in lets you link stocks to cells in the spreadsheet and updates them in real time. You can get the add-in free from the Excel Stock Connector Office Store page. Or download this template Excel file that already has the add-in set up with some sample stocks. The add-in works in Microsoft Excel 2013, Excel 2016 for Mac and PC, Excel Online, and Excel for iPad. It allows you to choose the location where it inserts the price or the daily change. Then those values are updated automatically throughout the trading day at an interval you specify, as quickly as once every 5 seconds. Real-time data is available for contributors. The add-in is intended for creating a variety of portfolio-tracking spreadsheets or more complex stock-management tools in Excel. Any holdings supported by the IEX exchange are supported by this add-in, including US stocks and ETFs. The user base is growing (around 40,000 monthly user sessions as of May 2017), but I still only get 20 to 30 requests/bugs/feedback messages per week, so each time you contact me it helps me improve the add-in. So go ahead and tell me about any problems or suggestions from the Stock Connector Uservoice page. Enter the desired ticker in the input box (eg. "MSFT" for Microsoft). If you don't know the ticker for the stock you want, you can search on the IEX exchange. A prompt will appear asking you to select any cell. Choose a cell in the Excel workbook where you want the live updating price to appear. The add-in writes the price in the selected cell and also gives more information in the task pane, including the ticker, the last trade price, the percent change since the previous close, and the time of the last reported trade. This information is displayed for the time zone of the stock's exchange and is delayed by default or available without delay (real-time) as a premium feature for contributors. That's it! To insert the daily change % into the spreadsheet as well, select the change value for that stock in the task pane. Then the add-in will prompt for a location in the same way that it did to add the stock initially. Clear the contents of a cell to unlink it from the add-in. On Nov 12, 2017, Yahoo blocked access to their API, so it's not longer possible to connect to international stocks. I'm working on finding alternative data sources. Often you'll want a quote to appear in multiple places on a spreadsheet. 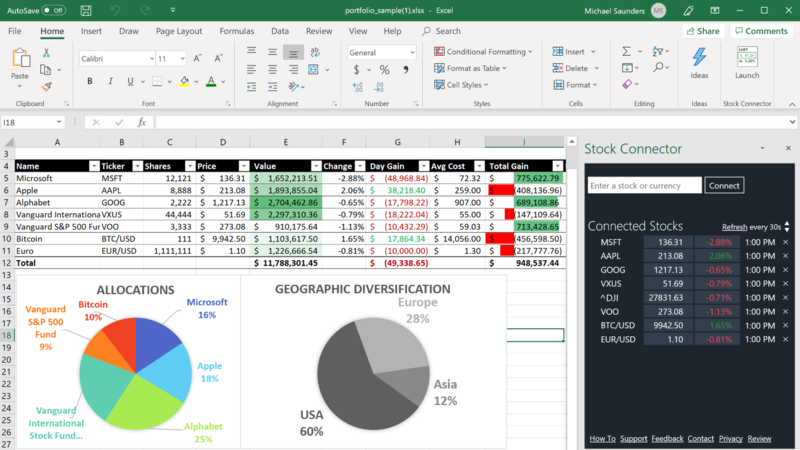 Since the Stock Connector add-in only lets you insert each quote in one place, you can use the power of Excel to show it in more places. Let's say you want a price to appear in cell A1 and B1. First connect the price to cell A! as usual. Then type in =A1 in cell B1. Now both cells will be updated automatically as the price changes. 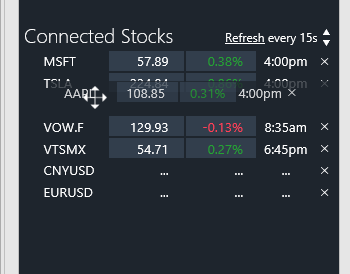 If you want to get fancy, you could even create a separate sheet specifically to hold connected stocks, and use a forumla like VLOOKUP to automatically get quotes for any stock on the main sheets. If you manage a lot of stocks in the same spreadsheet, you might forget which cell you've connected for a particular stock. The solution is simple: just click the price in the task pane and the cell you're looking for will be selected. By default, quotes are updated automatically every 15 seconds. You can change the update frequency by clicking the two small arrows to increase or decrease the amount of time between updates. The minimum interval for automatic refreshing is 5 seconds in Excel 2013 and Excel for iPad, 30 seconds in Excel Online. At any time you can refresh all your stocks immediately by clicking the word "Refresh". You can prevent stock prices from updating automatically by clicking the upward-pointing small arrow until the add-in displays a ∞ symbol. Then click Refresh whenever you want to update manually. The number of securities per workbook was not limited with Yahoo's data source (now discontinued). The new data source supports a maximum of 100 stocks per workbook. However, as of 12/29/2017 I have implemented a fix that allows an unlimited number of stocks with the new data source. There is no way to automatically connect large numbers of stocks all at once using Stock Connector. They must all be entered individually. However, I'm working on a new add-in which will enable this type of functionality in the future. Excel 2010 does not support Stock Connector or any other web-based add-ins. 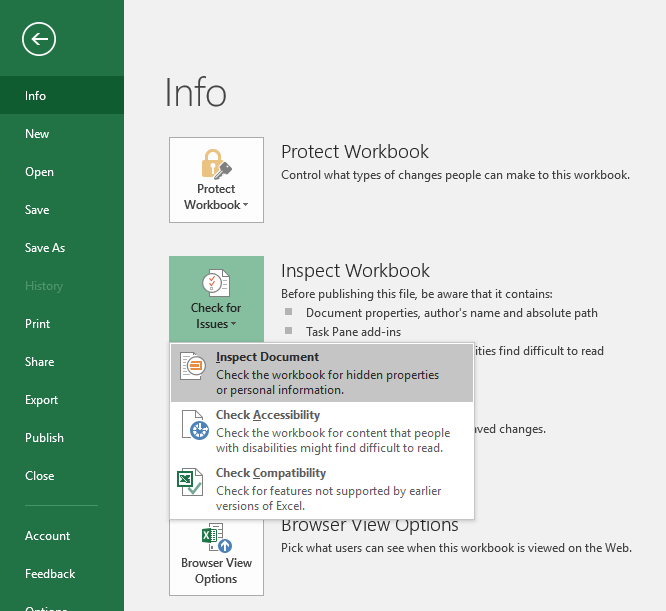 If you're using Stock Connector with a workbook and then open that workbook in Excel 2010, you will still be able to use all the normal Excel features, but the stock prices will not update. Once you reopen the workbook in a supported (more-recent) version of Excel, the stock prices will start updating properly again. In rare cases you might find that Stock Connector seems to be "corrupted". For example, it might prevent you from adding valid stocks or loading any prices for your existing stocks. The exact causes of this bug are unknown, but events like the removal of a stock from an exchange (eg. acquisition) could be one cause. Once you're done, you can insert Stock Connector again and start reconnecting prices. If you have suggestions, requests for features you'd find useful, comments, bug reports, or you need help with something that isn't explained well above, please let me know at the Stock Connector Uservoice page or send a request via email at tickets@stockconnector.uservoice.com. The add-in never collects, stores, or transmits information that can be used to identify you, except for PayPal data: If you use PayPal to contribute, then PayPal provides Stock Connector with the email address and name from your PayPal account. The add-in does collect anonymous information about how the add-in is used, such as how often it's launched and which buttons get clicked. These logs are collected through the Google Analytics web service. To distinguish users from each other, the add-in generates a random number for each user, which is stored on your computer and can be removed by clearing your cookies. The information collected is used only to improve the quality of the add-in and is not sent or sold to any third party. The data provider is IEX. In order to retrieve the stock quotes, the add-in sends IEX the list of stock tickers for each refresh. Stock Connector is provided with all its core features for free. I fund Stock Connector via $10 voluntary contributions, which can be made through PayPal from the Stock Connector task pane. I do the development work including bug-fixes myself in my free time, around 4 hours per week. Once a user contributes through the add-in, the add-in stores their Office account identifier in a database. From then on, those users get access to premium features. Those users also get a promise to never see ads in Stock Connector, now and in the future. These premium features work no matter what computer, document, or operating system you use for Stock Connector. The only requirement is that you sign in to Office with the account you used when you made the payment. The PayPal account you use does not matter: the only important account for Stock Connector is the one you use to sign in to Office. The prompt to contribute via PayPal goes away, of course. If you'd like to contribute again in the future, you can do so directly above. Real-time data (not delayed 15 minutes). This switch happens automatically and is reflected in the displayed last-trade times. Reordering of the stocks and securities list in the task pane. 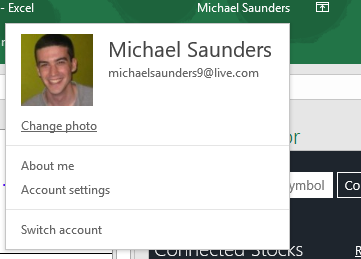 Hovering over the name of the stock changes the cursor to a cross shape. You can then hold down the mouse and drag it (or drag your finger) to bring the stock to its desired location in the list, which will be saved automatically for future sessions. I will continue to add a combination of some features for everyone and some features for contributors only. Sign in to Excel on a PC or Mac (if you're an iPad user, the premium features will still work on your computer, but only if you contribute from a Windows or OSX computer first). Make sure you have at least 1 stock in your list to trigger the contribution prompt. Click the PayPal button and follow the instructions in the new window to contribute. 10-15 seconds after the payment is completed, the ad should disappear and the premium features should be activated. I will continue to maintain and improve Stock Connector as long as I'm able. Changes in financial data providers have the potential to prevent Stock Connector from working in the future, so this service may not be available indefinitely. I have no reason to believe that will happen, but it's important to disclose that possibility. As always, you can of course use the add-in completely free. And I promise to never make you pay for access to features you're already using. The data is provided for free by IEX. Therefore, these IEX terms apply to your usage of this add-in: https://iextrading.com/api-exhibit-a. As you may know, Stock Connector previously used Yahoo as its data provider. On Nov 1, 2017, Yahoo disabled external access to its free financial data without warning, 12 years after the service was introduced. On Nov 9, 2017, Yahoo posted an official response. This change broke Stock Connector and many other tools across the web. Of course, it was always a known possibility that Yahoo would decide to shut down its free service, especially after its purchase by Verizon. I will continue investigating ways to address those disadvantages with other data sources, but I can't make any guarantees there. Please let me know if you're aware of alteratives I can use. Thank you! You can view the latest updates and bug info at https://www.michael-saunders.com/stocksapp/pages/datasource.